Last December, a fire destroyed the SLO High computer lab and damaged an adjacent building, causing a total of about $1.8 million in damage. Shortly afterwards, officers arrested three former SLO High students whom they found nearby inside a car belonging to Jacob Lee Ruth. A trial for Ruth, 20, wrapped up Monday with the jury convicting him of starting a separate fire that destroyed a portable toilet at SLO High days earlier. The jury found Ruth guilty of two counts of burglary and one count of arson. On the arson charge pertaining to the blaze that destroyed the computer lab, the jury hung 11-1 in favor of convicting Ruth. When Judge Jacquelyn Duffy asked the jury whether the jurors could reach a unanimous agreement, none of the jurors raised their hands. Prosecutors have yet to decide whether they will retry the case. They have also yet to decide whether they will pursue a county jail or state prison sentence for Ruth’s convictions. Ruth faces four years and four months behind bars for the three charges on which he was convicted. If he were to be convicted of all four charges, he would face up to eight years in state prison. On the night of the computer lab fire, officers found an unused road flare with a stick attached to it while searching Ruth’s vehicle. A partially burnt flare of the same model was reportedly lying at a location outside the car. 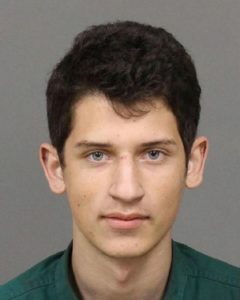 A court declaration filed by the district attorney’s office stated Michael Benadiba, one of the other defendants, confessed to detectives that all three of the former SLO High students were responsible for the computer lab fire. But Matt Guerrero, Ruth’s attorney, argued that his client was only responsible for the portable toilet fire and not the computer lab blaze. A hearing is scheduled for Aug. 23 to determine whether the prosecution will seek a new trial in Ruth’s case. To all the keyboard warriors that have opinions about this case, I ask you this; Did you know that this young man admitted to the things that he did knowing there would be consequences for his actions? Also, that he’s remained in custody even though he could’ve been bailed out. These are the acts of an individual that has started to atone for his poor choices. No, you probably didn’t as it’s easy to judge from your keyboard. The charges he was convicted on are the ones he fully admitted to. I know that the devastation caused by the fire was a tragic crime that should not go unpunished, it just needs to be placed on the correct individual responsible for that crime. We’re all free to express opinion, all I ask is that you take the time to understand the facts before writing that opinion. Didn’t they all participate in a conspiracy of malicious mischief and thus be guilty of all crimes committed? This is weak, prosecutors. He’s probably having wet dreams about Columbine and Sandy Hook as his prosperous parent’s cuddle their little angel. Throw the book at him. Make an example out of him. This isn’t some DUI or random Assault charge. This was planned out and followed through with. Have him pay restitution for the rest of his life. Welcome to the real word kid, time to put your big boy pants on because you’re going to need them in prison. Jacob Lee Ruth is totally guilty, and he should have to reimburse taxpayers for the $1.8 million dollar cost of his criminality. I say the SLO County DA, Mr. Dan Dow ought to retry this punk on the charge that the one lunatic juror refused to vote him guilty on, and hopefully the judge will severely punish this perp for his idiocy. People like Mr. Ruth need to be put in check, how can he or his family ever hold their heads up in San Luis Obispo ever again?